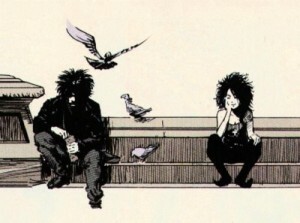 The Sandmand with his sister DeathNews came out earlier today via The Hollywood Reporter's Heat Vision blog that Warner Bros. television was attempting to buy off the rights to Neil Gaiman's epic comic series "Sandman" to turn into a televison series. The man on the top of their list to run this adaptation? 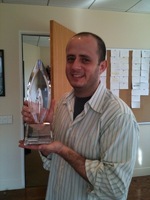 None other than Supernatural creator and former show runner Eric Kripke. So my favorite comic book adapted by the creator of my favorite show? There could be nothing wrong with that, right? Wrong. Various entities have been trying to turn the Sandman series of comics into movies and telelvision shows since about the time Neil Gaiman finished his classic series in the mid-90s. The closest an adaptation has ever come was a proposed HBO series that Gaiman was involved in behind the scenes (though only unofficially). But still it fell through. The more self contained comics involving Death – the Sandman/Morpheous/Dream’s sister – has been trying to get off the ground as a movie for years, and it has also been stalled. Gaiman has a unique voice and the ability to twist together complex stories into flowing works of art, creating a pastiche with references to classic works, mythology and pop culture. - Dark is not new to him. He pushed the envelope as far as he could with Supernatural being on a network channel (the WB at that). - He knows how to tell a self-contained story, moving from point A to point B and then stopping. Yes, the show is moving to it's sixth season, but Kripke wrapped up his five season story arc for Sam and Dean, and immediately stepped down. His story was told, time to move on. This could work to his benefit when working with already structured story. - He is such a fanboy that he would respect the source material as much as he could while still creating compelling television. - If Gaiman isn’t involved, this should be put into an early grave. So far he hasn’t made any comments and earlier today he announced on Twitter that he was dropping off the face of the planet for the next few weeks (presumable to working on a book or the Anansi Boys movie script). There’s no way someone else could create a passable version of Gaiman’s unique voice. - Warner Bros. television is looking to replace Smallville with another DC property. If this is the property they’re looking at, what the hell are they thinking?! This does not belong anywhere near network television. It deserves to be on pay cable, though basic cable could probably create a decent adaptation (perhaps on AMC as a companion piece with the Walking Dead series?). - I can’t imagine anyone who could passably play Delirium or Despair without coming off as parody. Casting would be very difficult and with a cast as large as Sandman has (there are seven Endless siblings just to start), it would be difficult to not end up with at least one weak link. But in the end, this is all speculation. Warner Bros. doesn’t even have the rights to the comic yet, Eric Kripke has been cautious with getting involved, and it normally takes a couple of years to get development like this off the group. After my initial flailing excitement, I’ve decided that this has so much potential to be awesome while having the same potential to be awful. For now, I’ll just be patient and keep an eye on developments. The original story can be found at Heat Vision here. Jill Thompson's version of the Endless from "The Little Endless Storybook"